All students must have access and opportunity to reach their full potential. Ensuring that students have access to a high quality, holistic education that will set them on a path for education and career success is critical to our nation’s future. But this road for underserved students has unique challenges. Many underserved learners face disparities compared to other students in their access to high-quality educators and support services that help create the foundation necessary for every child to succeed after high school. The recently released ACT Condition of College and Career Readiness 2018 report has found that college readiness levels for underserved learners — who represent nearly half (43 percent) of the ACT-tested 2018 U.S. high school graduates — lag far behind other students, with only a fourth of underserved graduates showing overall readiness for college coursework. Even more troubling is that underserved students continue to lag far behind their peers in the area of STEM. 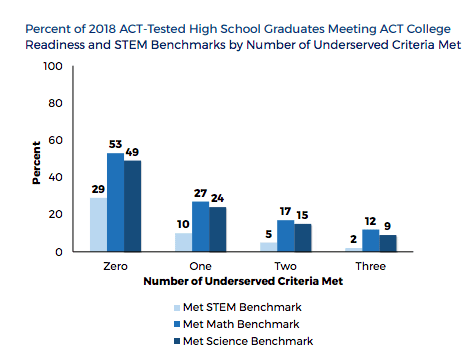 Consistent with last year’s report, only 2 percent of students meeting all three underserved criteria (first-generation college student, coming from a low-income background, and identifying as a minority) achieved ACT’s STEM benchmark. Additionally, the report shows slightly fewer ACT-tested graduates were ready for college coursework this year compared to last year’s graduates. A higher percentage of students this year than in recent years fell to the bottom of the preparedness scale, showing little or no readiness for college coursework. For further information about this research please read the detailed Condition of College and Career Readiness 2018 report here.